Nestled in the Siskiyou Forest in Oregon, in a funky concrete round house, lives a talented artist known as Dilu (a contracted form of her name--Diane Lundgren). Within the rounded walls live more gollies than one can count, two cats, a parrot and one hubby. Dilu was born in California and was blessed with many travel opportunities as a youngster. "I loved discovering various cultures where I lived and attempting to learn and use the local language, dialects and customs." Her love of collecting started when she was young. By redeeming product box tops, she would receive a boy or girl doll dressed in traditional costuming with a small flag and a coin. 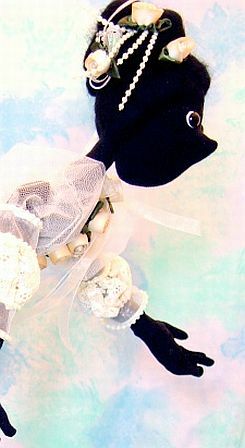 Dilu fondly remembered, "I loved those dolls. I never played with them, but I had a special case my father built to keep them in and I watched the collection grow." Dilu believed it was the first she knew of collecting without playing. 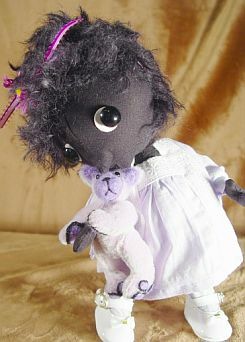 Other dolls belonged to her sister; her sister did not want them so she gave them to Dilu. She still has the treasured dolls from her past, and she notes, "Now they are worth something too!" Dilu grew up under the tutelage of her mother's sewing skills. "I was wearing dresses that I made when I was about 10 years old. They were not very good but my mom kept at me, being very strict and stern, and I learned to pluck out stitches like a pro." Ever grateful to her mom for being so exacting, she watched her sew, change patterns and dream up new ways to use fabrics. Diane grew up believing that everyone strived for perfection that way. Diane recalled an incident in the seventh grade: "I was told I would be taking a sewing class and that we would make an apron," she said smiling. Seeming a waste of time, she wore one of her better outfits to school and had the teacher examine her garments. "Do you really want me in this class?" Dilu asked the teacher. Upon looking at the stitch, the matched plaids, the home made bias bindings; the teacher decided Diane would be bored with the class rather than inspired. "I was glad as it gave me an opportunity to take another class and more interesting than what I lived and breathed at home all the time." With formal education and training, Diane bcame a Registered Nurse with certification in Psychiatric nursing; she began quilting to relieve some of the stress that came with the profession. She continued to study couture dressing and sewing, even though she had been sewing for years. 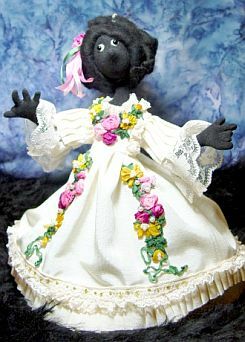 "When I was 8, I learned a piano piece called the Golliwogs Cakewalk by Claude Debussy. It was one of my favorites and still is. 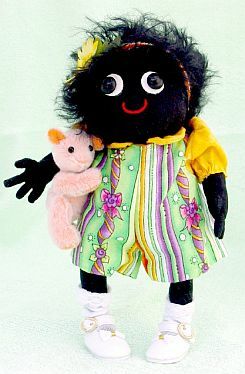 For years I tried to find out what a golliwog was," she said. "In time I met some ladies who made bears and they loaned me several teddy bear magazines and there they were, Deb Canham's Gollies!" Excitedly she turned to her husband and said, "I can do that!" Three years have passed and she hasn't stopped creating yet. All the sewing skills she learned came into play and gave her a wonderful reason for collecting antique and vintage lace and fabrics. "I was very wrong on one thing; I can not do what Deb, Robin Rive or any other Golly artist can do. I can only do what I do. And no matter what people think, I still love what I am doing," Dilu commented. 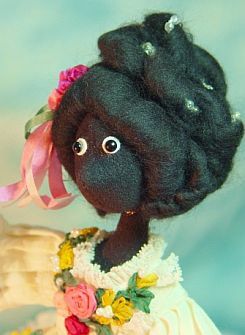 Dilu makes all her own designs and dolls. 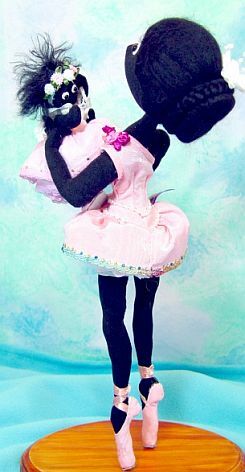 "I study what others have done before me and have tried to make dolls that look like theirs, but no matter how hard I tried, I couldn't seem to copy another person's design. 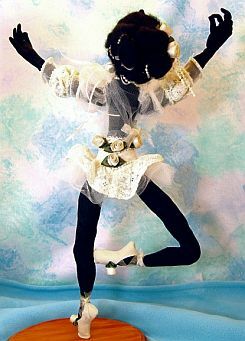 That was frustrating but now that I make and sell my own dolls, I feel individuality is a good thing." "I don't know what my gollies are best known for; they are just my gollies," she stated. "The people who love them, really love them, and the people who don't like them are polite," she continued. 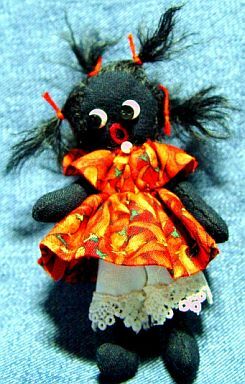 She was once told, "Honey, that doll is so UGLY, she's cute!" But for the most part, she believes the teddy world really is a pleasant place to spend one's life. "I am glad I found it." 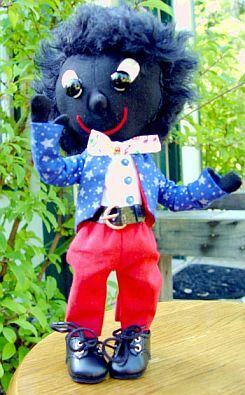 Though currently "retired," Dilu spends time designing, sewing, searching for special fabrics, and thinking about gollies and dollies. Dilu is a Help Advisor at TeddyTalk.com and "that has been wonderful and I am having a blast!" she said excitedly. "It affords me an opportunity to see so many bear artists develop their style and grow in their art. I have been given the chance to make so many truly close relationships with the other help advisors, administrators, and fellow online talkers. It has been a wonderful opportunity for which I am grateful," she said. "I collect bears but decided rather early on that so many artists could make them far better than I could; it is more fun to collect from these bear artists." As one might imagine, it is always a big "to do" when a new bear comes to live at The Golly House. Although Dilu doesn't consider herself an artist yet, she feels she's grown in her skills and accomplishments. "My father was an artist and I just don't think my work stacks up yet to his level. But it is what keeps me working harder." Diane adds, "When I grow up, I want to really be an artist!"